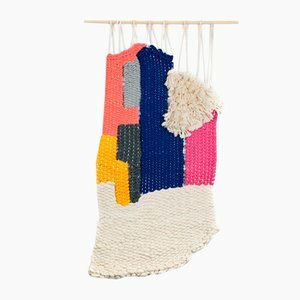 Bright, bold, and joyful, Mariadela Araujo’s textiles infuse their environments with warm, abstract blocks of woven color. 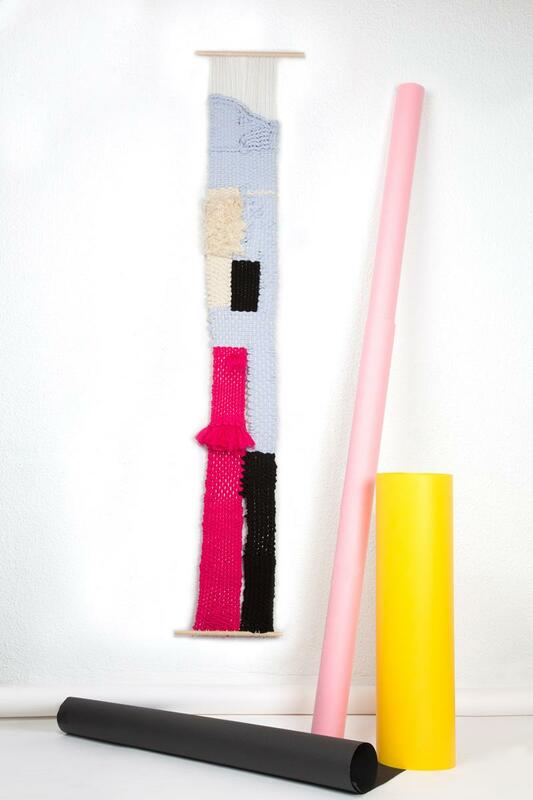 Mariadela Araujo is a Venezuelan artist, weaver and fashion designer based in Barcelona. 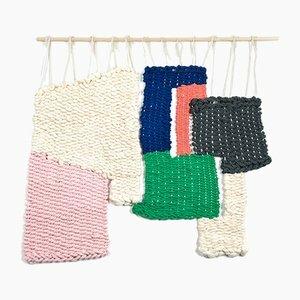 Her love of textiles originated at a young age in her home city of Caracas, and she formally trained as a fashion designer in Rome, before specializing in tapestry and weaving techniques in Barcelona in 2012. 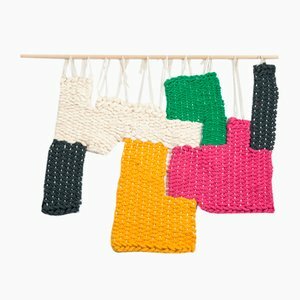 She established her studio, Paella Showroom in the same city shortly afterward, and it began as a fashion and art hub; contributing to the art and local culture of the city, it evolved into a textile laboratory. 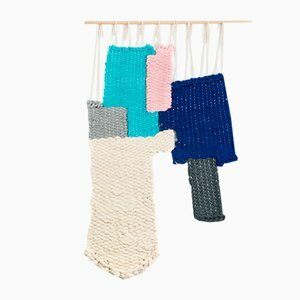 Now known as Paella Studio, it is an experimental atelier in which Araujo concentrates on interdisciplinary approaches to creative output, encompassing weaving, installation art, and interior design. Aiming to tell a visual story based in bespoke traditional craftsmanship and contemporary aesthetics, its bold shapes and bright colors juxtapose Caribbean palettes with European codes of design. Araujo is influenced by abstract expressionism and kinetic art, and develops her ideas through color studies and compositions. The material helps her to translate the idea into reality and to expand it into space, and she wishes to provide a means by which the use of color, in and of itself, provokes a reaction in the viewer. 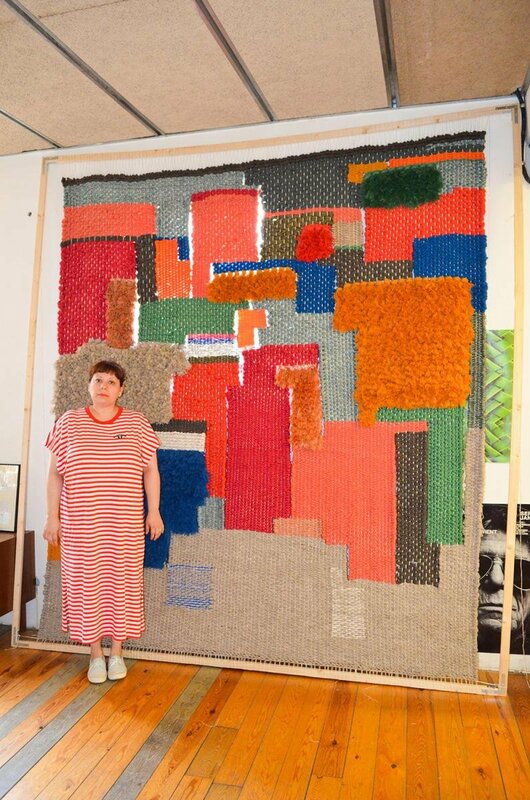 Her pieces, therefore, fuse the warmth, comfort, and craftsmanship of textile art with the bright, joyously combined color and spatial planes of twentieth-century painting. 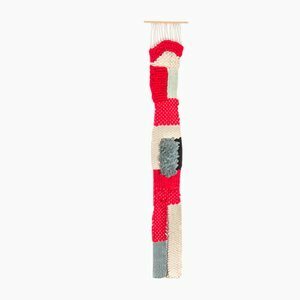 In so doing, she playfully draws attention to the craft, and interrogates the viewer’s expectations surrounding the form and function of a tapestry. 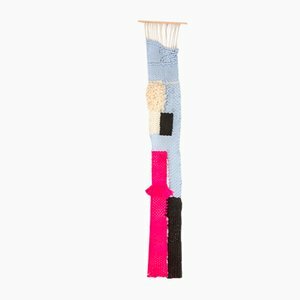 Her Geométrica wall hangings arise from research into the limitations and possibilities of contemporary textile art. Working with a looser and more experimental hand, their bold shapes and bright colors juxtapose in an eclectic fashion, manipulating the variables of the traditional frame, and inviting the viewer to consider the concept of a frameless tapestry, and the ways in which this can create a multitude of compositional possibilities. 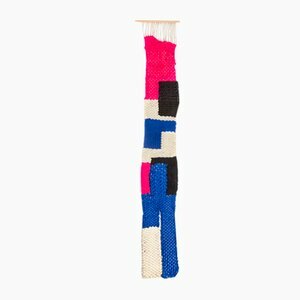 Generated in map-like combinations of contours and color, the pieces, woven in cotton, have a delightful vibrancy suggestive of the instinctive experimentation of the artistic process. 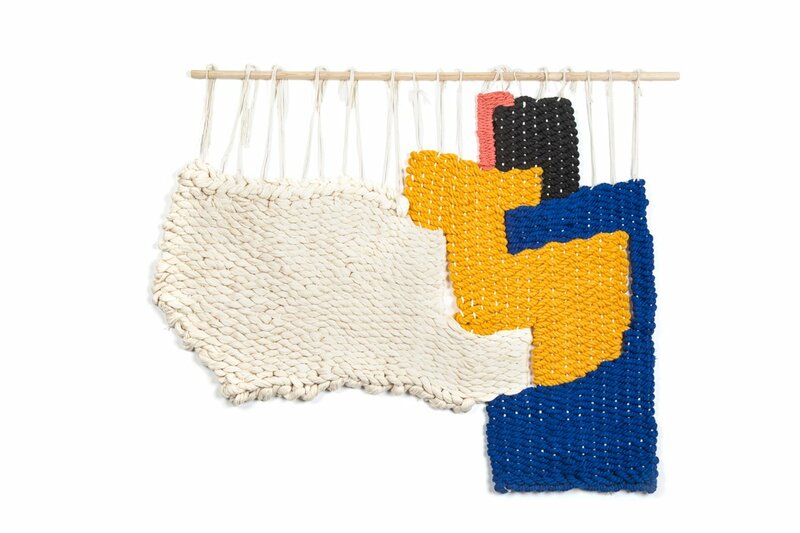 Araujo’s Chrome series, meanwhile, is the result of investigations of tone and form using a long and narrow loom. 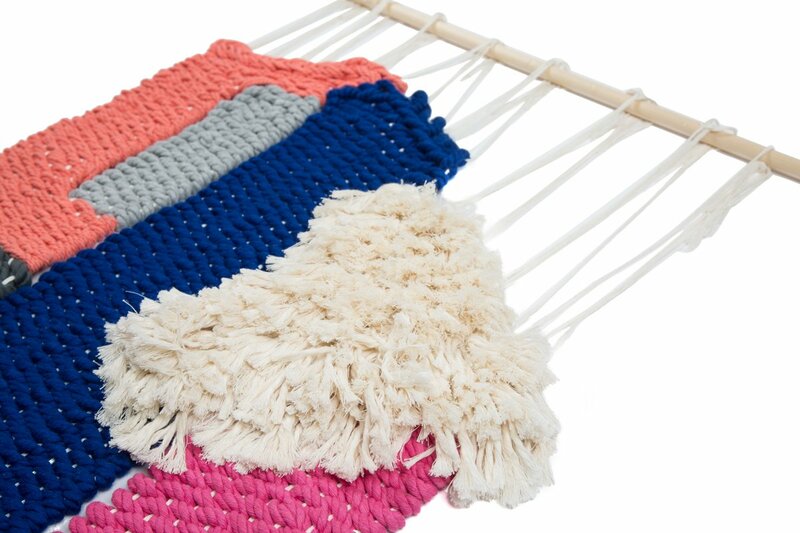 Weaving with natural materials, bright colors, and bold shapes in a carefree fashion, it offers an expressive, painterly approach to craft processes that have traditionally been viewed as rather restrictive. The resulting columns possess an elegant, sculptural quality, enlivened by Araujo’s cheerful palettes. 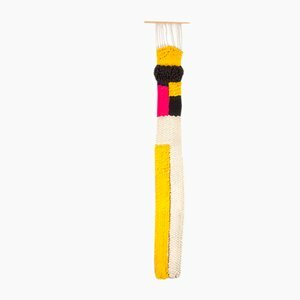 Araujo’s lively weavings are produced in a range of scales and for a variety of purposes – as installations, they brightly adorn buildings, and as clothing, they dress and vibrantly express the human form. 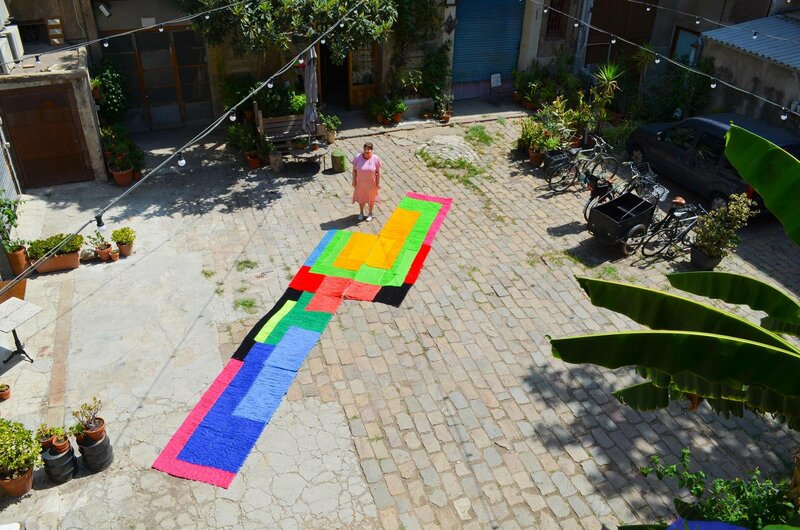 Her embroidery installation as part of the ARTNITCAMPOS festival in Mallorca in August 2018 resulted in a large-format tapestry cascading down an old tower, its bright, modernist color-blocks contrasting energetically with the old stone of the building. She has collaborated with fashion designer Amal Rodriguez, supplying knit couture, embroidery masks, clothing details and hat couture to her Autumn/Winter 18/19 show. 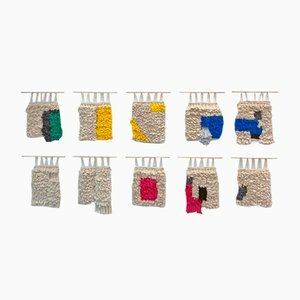 During the Paella Showroom years, Araujo produced, organized, and selected artists for the textile art festival, Ciclo Textil in 2015 and 2016. 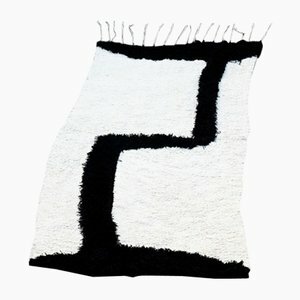 She has had artwork commissioned by Limited Edition Rugs, Belgium, and has also produced tapestry installations for restaurants, shops, and private clients.